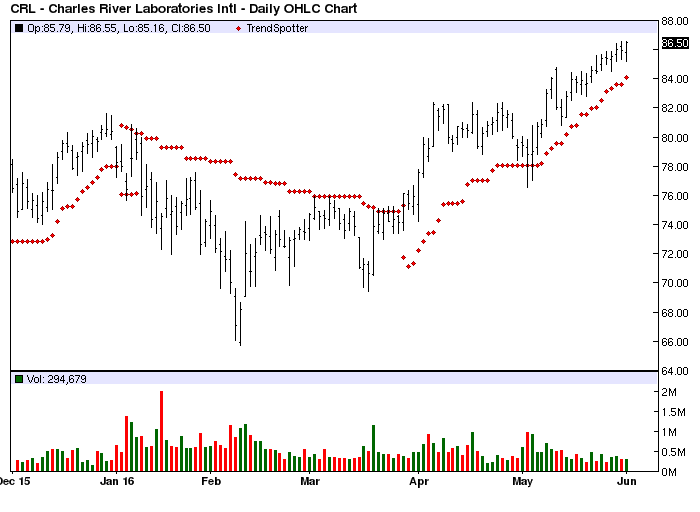 The Chart of the Day belongs to Charles River Laboratories (CRL). I found the medical services stock by using Barchart to sort today's All Time High list first for the most frequent number of new highs in the last month, then again for technical buy signals of 80% or more. Next I used the Flipchart feature to review the charts for consistency. Since the Trend Spotter signaled a buy on 3/29 the stock gained 13.64%. Charles River Laboratories is a leading provider of critical research tools and integrated support services that enable innovative and efficient drug discovery and development. Charles River is the global leader in providing the animal research models required in research and development for new drugs, devices and therapies and has been in this business for more than 50 years.